People play on the brink of insanity. To survive, they train. Even if you're not in the habit of base-jumping, improve your athletic ability with these three workouts! How do these extreme athletes train? What types of workouts do they use to build multiple strength qualities? An extreme athlete, no matter if he or she is an MMA fighter or base jumper, needs to train for the sport. Even the weekend warrior who spends winters on the double-black-diamond tracks and summers biking rocky mountain trails needs to develop the proper qualities for success. For the extreme athlete (amateurs included), a training regimen that develops functional strength, balance, endurance, flexibility, and explosiveness is going to make a lot of difference. These qualities make a good athlete great. It's tough to develop them concurrently, but not impossible. Before we dive into the three-day training split, let's take a closer look at the qualities we're training. The concept of functional strength is often a source of confusion. Don't assume that for an exercise to be "functional," you need to be pulling on cables while wobbling on a board. At some level, every exercise is functional, and increased strength is itself functional. It's a question of degree: A chin-up is much more functional than a machine preacher curl, for example. 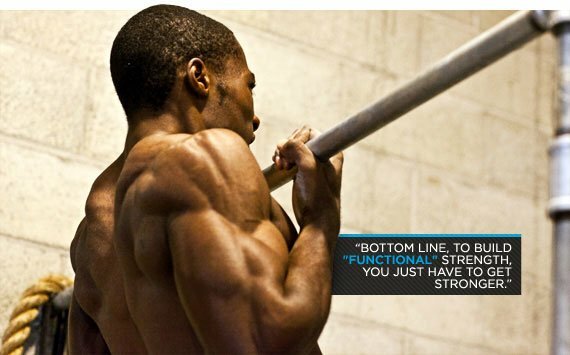 Bottom line, to build functional strength, you just have to get stronger. I've chosen exercises to help you get stronger, faster. Improve your balance by activating the gluteus medius—the muscle primarily on the side of your hip—with single-leg exercise. At the same time, you need to use your peroneals, which are the stabilizing muscles right above your ankles. Balance training means strengthening your glute medius and teaching your peroneals to stabilize your ankles. Typically, we marvel at mixed martial artists or cyclists who never seem to get winded. They don't gas out as early as their opponents. I hate to disappoint, but endurance may be more a function of genetics than other athletic traits, like strength. Don't be discouraged. You can still increase your endurance, or your body's ability to produce and deliver oxygen more efficiently, through training. You can do this primarily by spending less time resting. Flexibility is often glossed over, yet it is the most critical aspect of any strength program. Most people mistakenly think flexibility just means a little static stretching. There are more advanced ways to view flexibility training: a free weight exercise with a full range of motion is your most potent weapon in the fight against muscle tightness. Performing a full range of motion teaches your central nervous system to relax. Weighted stretching can also enhance your flexibility because it has a profound impact on the muscle fascia. Stretch the fascia to increase both flexibility and muscle size. Many strength coaches mistake explosive exercise with plyometric or jump training. They assume that an athlete needs to jump all the time or use a weighted vest to increase explosiveness. This is only partially true. Sure, explosiveness can be increased through plyos, but you don't have to do them. Explosiveness can also be trained by pairing a small load with a large load, using bands and chains, and focusing on bar speed. 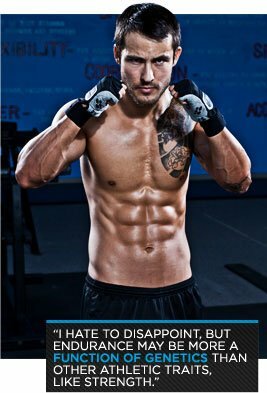 This workout follows a three-day split, with at least one rest day between workouts. Each workout develops multiple expressions of fitness to prepare your body for extreme feats. On those rest days, feel free to perform some type of cardio work, but don't go too intense. Our goal is to encourage recovery on the rest day, not add extra work.